I’d like to start by saying a special thank you to Laura Mullen and Larry Wood for their years of service to Richwood Place. We appreciate the many hours you have volunteered and served on the Board of RPCA. Thank you. I’d also like to introduce myself for those of you who do not know me. My husband, Moustapha and I have lived in our house on Lexington for six years. We have four children; Bakri- age 5 1/2, Maddux- age 4, Trinity- age 2 and Leeland- 6 months. We have a very busy and full house! We have been active members of the civic association for 6 years. I’ve served as Vice President and most recently as Chair of the Deed Restrictions Committee. This is my first opportunity to serve as president. I am a full time mom who also works as a contemporary worship leader at my home church, St. Andrew’s Presbyterian in West University Place. I enjoy singing, songwriting, cooking and baking, blogging, yoga and travel. 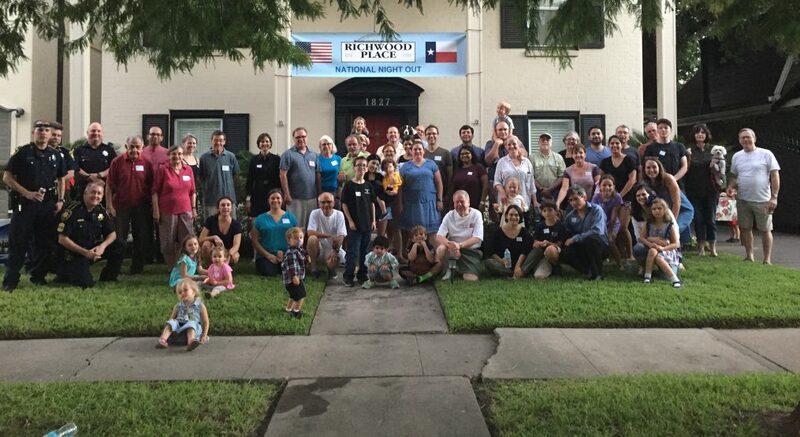 I feel very blessed to belong to this neighborhood and will endeavor to be a positive voice for Richwood Place. I promise to work diligently to address issues. Please call me or email me with any suggestions, concerns or ideas. I am looking forward to a great year. During the meeting, we discussed our biggest concern as a neighborhood- crime and illegal activity. We believe that many of the problems we are facing are directly connected to the apartment complex- Houston Medical Apartments at 1901 Richmond. We are focused on this property and what we can do to clean this area up. The Security/Safety Committee has placed this as a high priority and it is their first action item of the year. Please put the following number in your cell phone: 713-884-3131. This is HPD’s non-emergency line. Call them whenever you see any suspicious activity and report it. We will receive more police presence if we have more calls coming in. If it is an emergency, please dial 9-1-1. I’d also like to ask you to call our District D Councilmember, Wanda Adams. Her office number is 832-393-3001. We are asking for her help and for the City of Houston’s help in dealing with the safety issues we are experiencing from the residents and guests of the 1901 Richmond Property. This entry was posted in Events, Meeting Minutes, Ongoing Issues, Uncategorized and tagged 1901 Richmond, 2011, meeting, ongoing issues, richmond and hazard. Bookmark the permalink.